Samsung doesn't make official battery cases for its phones the way that Apple does, so third-party companies are usually swooping in to fill the void. After equipping the spring flagships Galaxy S8, S8+ and Note 8 with some of the best value-for-money battery cases, ZeroLemon is at it again, this time equipping the high-ender of the Android spring, Samsung's Galaxy S9+. How about doubling its battery life that is pretty middling, as can be expected from its Quad HD+ display and pedestrian battery capacity? 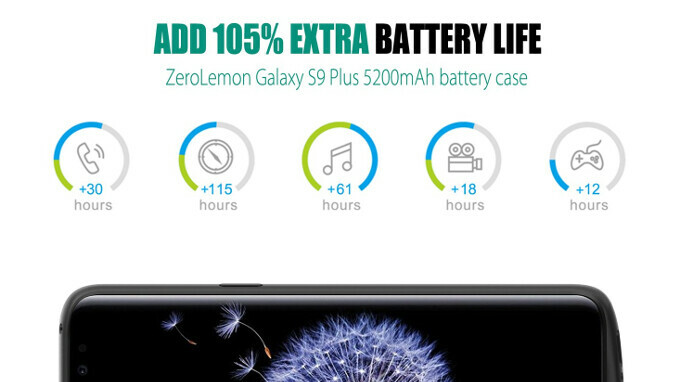 That's exactly what ZeroLemon's 5200mAh Li-polymer wrapper promises. If you are wondering why only doubling it at that capacity, bear in mind that this is not a battery replacement, as the phone is sealed, of course, but rather an external power bank of sorts, housed in a convenient S9+ case for a double duty. The gear has four colored LED lights to gauge how much charge it has left, and a pass through connection means you won’t have to take the case off first when charging. Granted, it makes the largish handset taller and thicker, but, if you will be taking the excellent S9+ camera away from a charger for more than a day, you might be willing to overlook the added bulk. The best part is that the ZeroLemon pack currently goes at $39.99 introductory price before it starts shipping on Amazon in the next two weeks, so hit the source link if you are interested. ...and will triple its already huge size. I understand your argument but I would counter by saying these are great for days when you know you're going to be out all day taking pictures and video aka trips and such. I would definitely get one of these for trips but I would use a power bank if needed one for every day/general use. You should have time to just relax for 15 minutes to quick charge your phone. Sounds like hell if you can't even take that time out of your day to relax a little. Where are you going to charge your phone if you're not near an outlet? Think about it. Say for instance you're in a new city and out exploring. Your phone can charge while you relax without having to plug it in to something. If you're out your out and your phone is constantly charging with a battery case. Don't make it more difficult than it has to be. Uhm.. Battery case makes you free to use your device without those annoying short cables and dangling issues. There are pros and cons, it's up to you if the pros are greater to your phone. I have the V20 as well and looking hard at the S9+. I never bought a standard battery for mine. I purchased a 6400mAh extended battery that was great though for long days. Made by Hyperion. Do they have to be this ugly though? Lol I wish they didn't but ZeroLemon is not in the business of providing aesthetically pleasing battery cases. They're 100% function over form and they do get the function part right. If you want to see ugly, look at the ones for the HTC 10. It has this huge bump on the bottom where the charge port is. Looks like this one only marginally increases the height of the phone, unlike the other ZeroLemon variants which add nearly an inch to the height. Samsung's battery backpack for the s7edge was the best. Much less compact and delivered power wirelessly so it didn't add any length to the chin. Although I don't need a back up battery even at that time, would like to see it brought back. Worked well for me but then again rarely needed it with wireless pads at home work and office. For $40 this is a steal for those who travel often using the camera all day. For every day use I think it's a bit much given the bulk that it adds.